We Take a look at this much maligned BSA Unit single clutch that was more a compromise than a design . The BSA Unit Single Clutch. Will you end up fitting one of these? One thing you can say that this item on a BSA or Triumph unit single does cause a lot of discussion, and usually not the praising type. So we will take a look at what we have got with this unit, and see if there is anyway to make it WORK, or even make it better. Or do you start adding up the cost of replacement parts and the stress of trying to get it to work with the time factor involved, or do you just save your money and go and buy one of Pete Kirby's Belt drive diaphragm units? Like most parts of this humble engine the clutch was a bigged up copy of the Triumph Cub, with another spring and a duplex chain fitted. 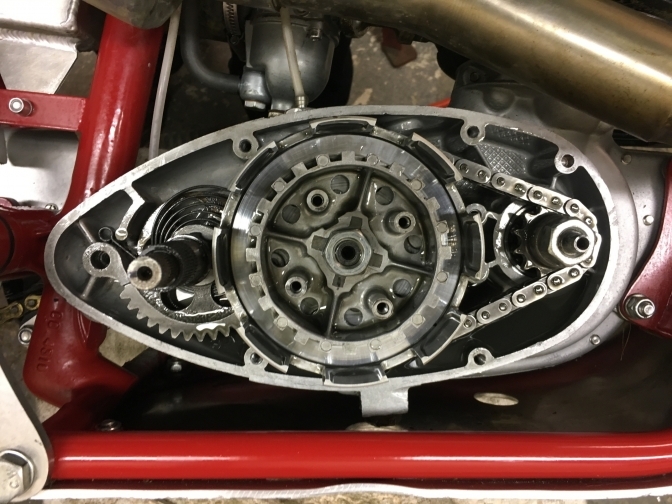 And this same clutch was still used on the Famous BSA unit Scrambles bike of bigger capacity used to win a World championship in the hands of Jeff Smith. So like everything to do with BSA -Triumph all parts were built down to a price and not designed up to work efficiently. Where do we start if you has one you has to make it work or take the opption above I have given you. To start with if you were working in a design office and had come up with this unit you would have been told to stand in the corner until you could come up with something better. Enough rambling lets see if we can solve a few problems with what we have. As you are probably aware there were two types of this clutch the Four Plate and the compromised Five plate, that was just a botched up version of the Four. 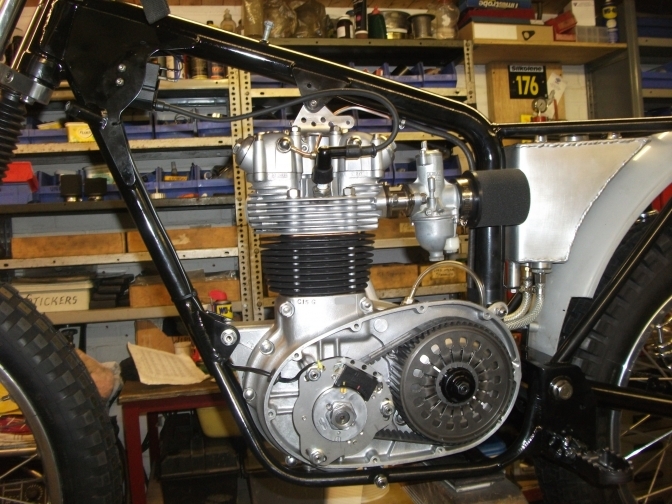 We will start going in from the top of an assembled clutch unit. 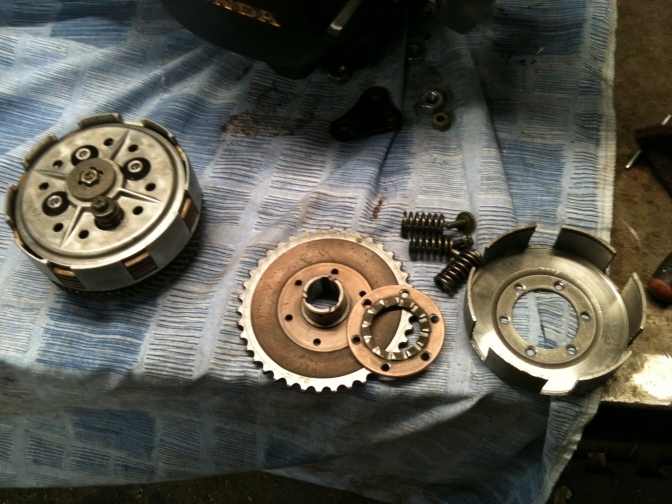 If you have what you should have a clutch that has lock-wire through the clutch adjustment screws, snip that wire out. Then take your modified large screwdriver with the centre part ground out and start by undoing the nuts? Not wired? OH Dear, are the nuts still there? You will probably need to release the spring with another flat blade before you can release them then. if not you will distort the springs? Why: well if you have a clutch that is up to stage three or was it four? of BSA's attempt to stop the clutch springs undoing you have knobbles on everything. Nuts .spring carriers notched into the pressure plate and knobbles that wear off quickly in the bottom of these to stop the spring turning in them, non of this so called development worked, and it had taken people that were paid a wage to come up with these modifications over about a five or six year period, when all they need have done like the Scrambles boys and Pat Slinn in developing the WD BSA's, Lock wire the Bleeding things, like we had done for years on race bikes. Just round off the sharp edge of these springs so that they don't catch on any thing. this will stop then trying to distort if they are free in there holders and give a better feel to the clutch, and then when you have spun the clutch up making sure the pressure plate is running true, Lock-wire the nuts OK. 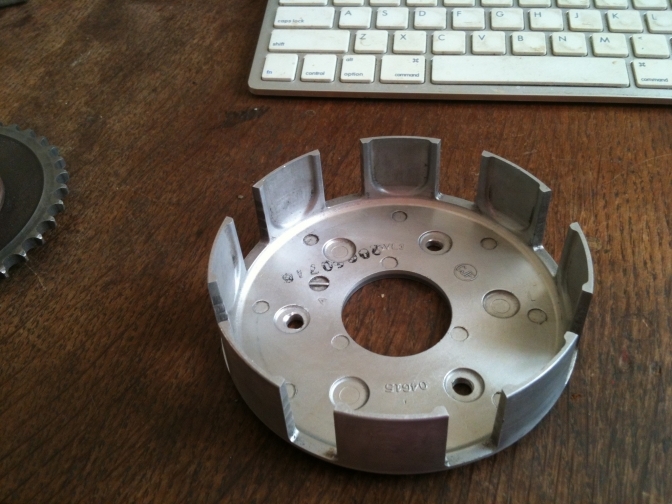 I have used Alloy pressure plate on a couple of the bikes, of my own design and-ones bought in. The others fitted to the five plate clutches I have removed and refitted steel ones. I think the Alloy was just to stable without distortion like the steel plates and with the extra distortion you get with the five plate conversion, the steel seems to work better. Right you now have the nuts and springs removed haven't you. Take a look at the pressure plate, is it shiny all over the pressure surface? if there are little black patches the plate needs truing and facing, best done on a facing table. also check around the edge of this pressing because sometime you do find small cracks, if you do bin it, some nice chap in India will be making New ones. Remove the plates, not easy unless you have a couple of little magnets and then it is simple. Worn out? probably, with missing lining and chewed ears, and again if the the steel plates have black patches and chewed ears they need replacing too. I take it you already have the clutch off of the bike ? if not use the proper puller to do this ,they are cheap and save one hell of a problem. If you are replacing all of the plates do so with the best you can find and if you are using the bike for frequent competition, fit something like Surflex as these should work better and last longer. 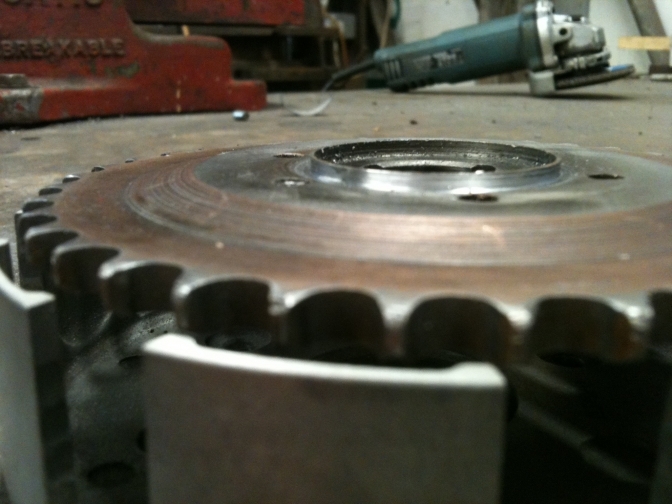 Right you Now have the hub and basket-chain-wheel assembly don't cut your hands on the sharp sprocket teeth? bet it was running out of line. Have you lifted out the hub? and dropped all the 25 rollers onto the floor? If it came apart that easaly you will need to Loctite it back in on assembly. If not just gently tap the centre from the hub with a soft drift,and watch those rollers, even that you will probably replace them. but one might come in handy if you drop a new one. Right you now need to check what you have, clean all the parts up with cleaner and then you can take a proper look. If the hub assembly has any movement ,and it will, this needs to be stripped too. The screws will have been riveted over or if it is a B50 they are rivets. But if they wont budge drill the screw heads off I have found this easier, then you can screw what remains further in remove the burs and then unscrew you will need 2BA countersink screws 1" long to replace these. Check for any excessive wear on the parts, if the hub has suffered with notching, if it is not too bad this can be dressed with a fine file. but you will of course make the slots a bit bigger. Throw the rubber Smarties away and buy new seriously if you put the old ones back you will get more rapid wear. Check the spider and centre for wear next, if when refitting the clutch and you get too much end float you can face off the spider to bring this back in line. but they "All do wobble sir and that's an end to it". 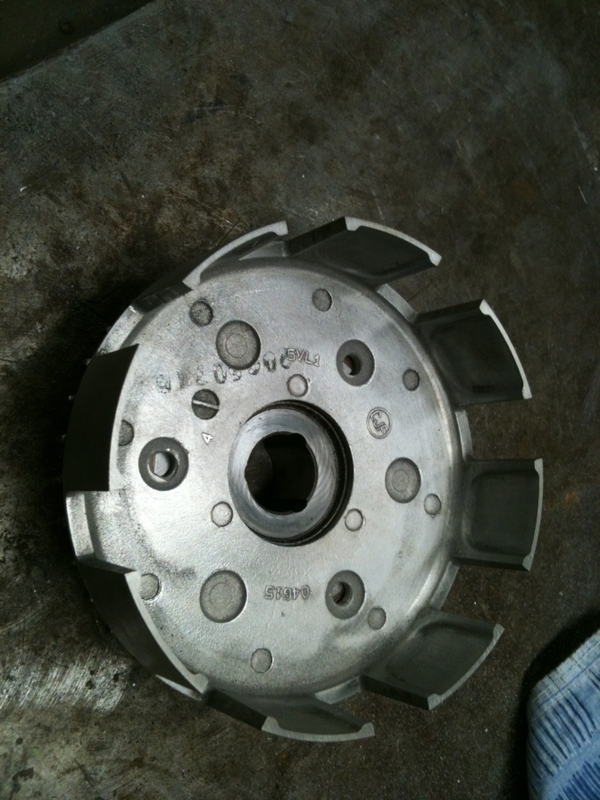 if you have the four-plate clutch this will have the smaller centre, about 55.48-55 mm. These seem to wear less than the more aggressive five plate, less pressure and distortion I feel. Check the roller track and the one in the chain wheel if it is to be used again and make sure the hardened ring in some of these ,(and there are ones without) Pattern Parts again, is not loose, if it is, you may get away with just Loctite-ing it or if it is good as far as plate spigots are concerned silver solder or bronze could come into play. The five plate conversion and they were all just that ,an afterthought of just trying to make something to work with the extra HPs of the later bike without spending an outside force by now, to design a New unit. there is a bronzed faced steel washer Part No (57-3931)"thrust for the doing of" between the "centre-hub-sleeve" and the chain-wheel to try and cure the wear and the wobble, does it work, not a lot, but it is better than the thing just grinding itself into dust every time you pull in the clutch,by the way fit this bronze side down if the clutch is on the bench,and check that you have the right machined chain-wheel for this to run on or you will be down to your local engineer with a BIG lathe to face this off. Ok we have Pulled this clutch apart in more ways than one, so part TWO will be sticking the thing back together and trying to make it work the best it can. Putting the thing back together. So have you got all of your New bits that you ordered or bought from e-Bay? What did you replace and what did you keep? I must say a couple of times I thought I was being clever and purchased two clutches complete for B25’s that were said to be in good working order but when I took them apart they were hardly any better than the ones I had removed. One was from a Mr. Stan Wonder! I have often wondered if he had a famous brother? Right bottom up this time. If you are using the same centre hub sleeve? Part No (57-3929) I hope you checked to see that the keyway and the taper were OK? Right grease the roller track and stick on the 25 new rollers you have, not 23 as I have heard told, if you have a gap and one roller turns over, you have a nasty noise and another wrecked clutch. And I hope you checked that on your five plate there is a thrust washer (Have you tried getting these?) I will have to have a word with my cousin in India or the one in Taiwan. Right gently turn on the checked out or New chain wheel over the rollers. Stage one. Simples. Now did you strip down the Hub or was it OK? As I have said I have dressed these, and faced off the spider back until it is the same level has the bottom plate of the hub, this should help with saving a bit of wobble. And if the parts are New just check that these match up, don’t take it for granted because they may not. Right if you are using the same stud plate or even if it is New run a ¼” BSF die over the treads and a Tap the same through the nuts. And also run a 2BA tap through the retaining screw holes. Did you order the New screws? Fit the new Smarties either side of the spider with the help of a drop of washing up liquid or soft soap if you have a dishwasher and don’t do the job manually for relaxation. I hope you checked that the studs were true as well? A tight fitting mandrill you have made is the best job for this. You can now screw the hub assembly together with the New 2BA Posidrive screws or did you get slotted? I sill can’t seem to find Allen bolts with this thread. Fit the hub onto the centre, pulling the two parts together with a large nut and bolt (1/2”) and a couple of clutch retaining washers. And watch those rollers not popping out. Put Bolt into the vice and one washer, lower the chain wheel centre over this, place the hub on, then another washer, and the nut ,and gently tighten, you should not need that much pressure, but if it just slides on you need the Loctite. 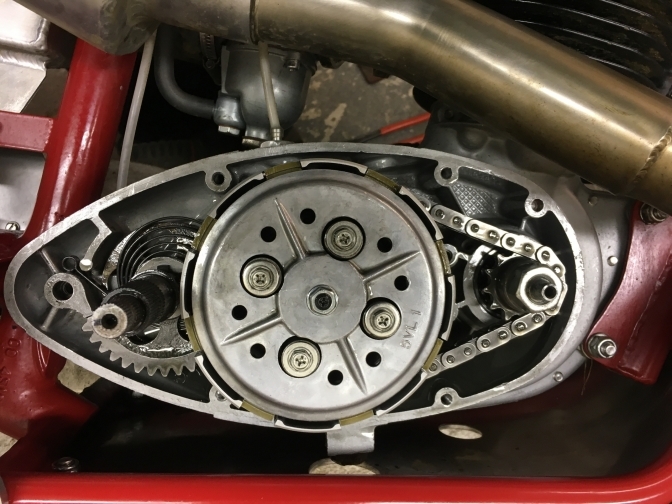 I find it best to build the rest of the clutch up on the bench as a dry run, and then you can spot any fault before fitting it onto the bike, and get the parts to go together sweetly. Plates should all fit without force and be smooth. As I have said I knock the sharpness off of the New springs and fit New. Because we know we are going to wire the nuts don’t we? If you have difficulty starting the nuts onto the spring studs. You can make up a tool that just screws into the top threads with a lock nut, short shaft and a Tee handle It does work and you never have springs and nuts flying all over the workshop and spending a half hour looking for them. Once you are satisfied with what you have put together. And I am fussy, the next stage is fitting the unit onto the bike checking the chain line and trying to set every thing up so that it works without clutch slip or drag. And feels light and smooth on the clutch lever. Part Three will be this. And seeing what alternatives there are. Right you have a four-plate clutch and have time on your hands to play at engineering. 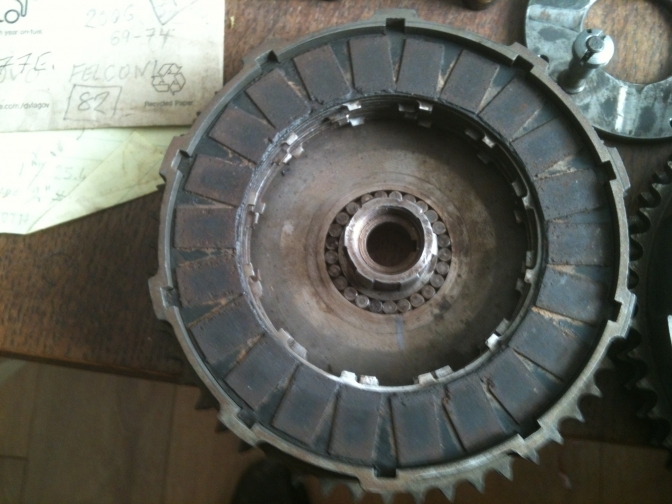 I will turn this Old clutch into one like the "Works" boys used for a while. So what do I need spending as less cash as possible? Well I take it you have a serviceable chain-wheel, centre with New rollers? come on you are not that tight surely? and a couple of-sets of old plates that you can juggle to find the best. 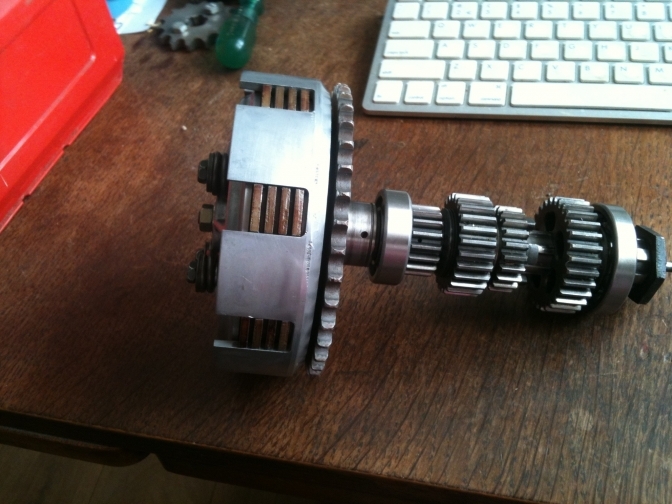 So next step is to strip the hub out and dress it with a file if it is not that bad. you then need to take it along to your mate with a BIG lathe, and if you are really flush and have bought a New larger centre (57-3929)you need to take the chain-wheel along too? Right your mate has plenty of time to play with his big lathe, because they are never busy,this type. I hope you took him a couple of cans along for payment? Well ask him nicely to turn off the last plate retaining spigot so that it is flush with the rest of the hub, and to face off the back of the chain wheel a bit larger than the area already done, so that the New hub and thrust washer you have taken along has something smooth to run on. If he refuses to cooperate with you, you needs to revert to plan "B" and grind the spigot of the hub off and it realy is Plan "B". As for facing the chain-wheel forget it. Plan "B" for this is to use the original centre and hope "it don't wear out to quickly." So drop the first drive plate into the bottom of the chain-wheel, well it works but what a waste, I sometimes use a plate with some of the friction pads missing on one side, Yes I know it makes it then tend to not distribute the weight evenly, but by how much? And half of them are over holes anyway. But if you are contemplating doing a SIX plate conversion ? you will have to take all the linings off one side, and bend the ears up slightly on the first plain steel plate. Naa! Later. Right now a plain plate, friction plate, to the top ending with the plain plate,this last plate should be nearly flush with the top of the chain-wheel, but not sticking out or you are in trouble, it wont work, and jamb up.If there is room for another plain plate to bring it level you can fit it, but I am not to keen on this idea, the friction plates you have bought must have thinner linings,not 4.2mm thick. it is all about Pattern Parts again. Dry run the rest of the build-up and there you have your "Factory" five plate clutch. You can see the difference in the size of the two centres, Larger one five plate ,and like it says Don't forget the Bronze-faced thrust washer. If you tap out the four "Oil holes"? to probably 2BA, you can use four of these bolts to act has a puller or pusher as may be, to part the hub from the centre. Good Ahy. That is if you intend to fit a new thrust washer. 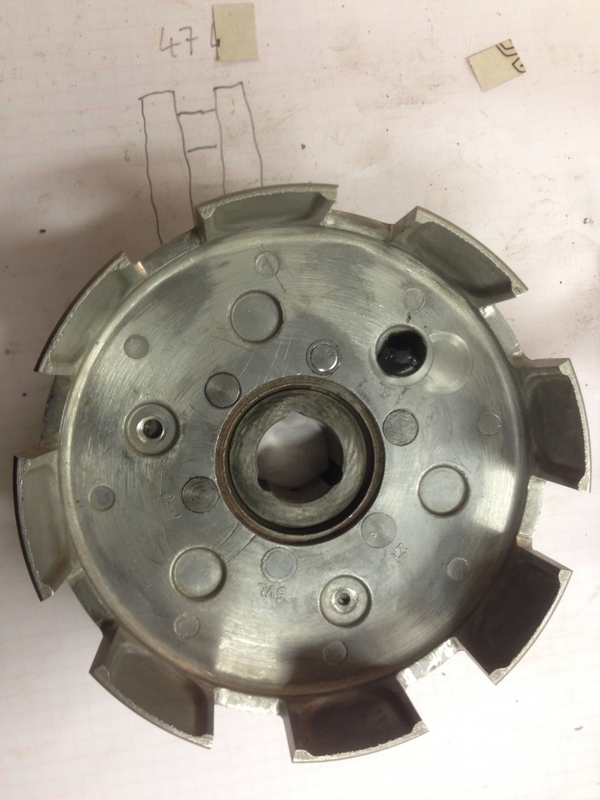 This is a clutch using a Four plate centre on a Five plate chain-wheel. Why? i am experimenting with this to see if I can come up-with a better thrust bearing solution. 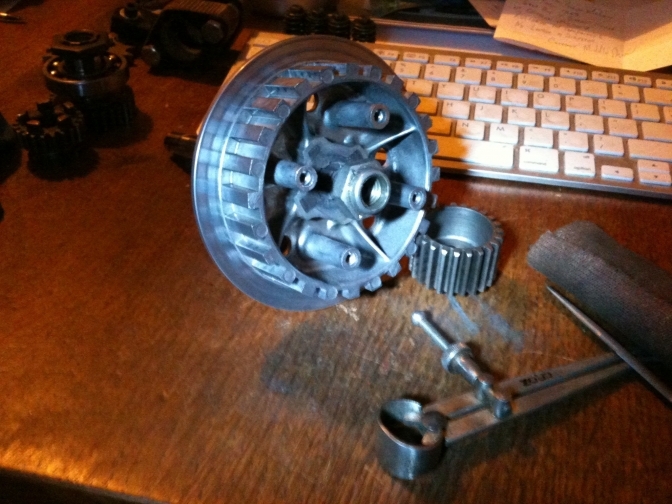 More later, about adjustment, and extending the clutch actuating arm on the side points models. Just take a Look at the latest Mike Waller Video. for a bit of "Clutchery". More later on the setting the clutch up the best you can. 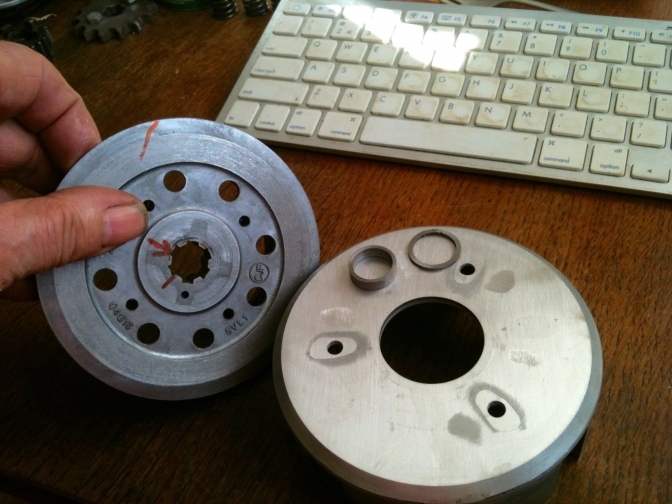 Fitting a Yamaha clutch to a BSA Bantam. Before you even consider doing this mod yourselves remember I have told you that this is the story about How I set too to do the conversion, and if you try doing this for yourselves don't blame me if you get it wrong. With one in front of me I can see why people fit them an it would be made a lot more simple if someone made a cover to clear the clutch with out having to reduce it’s width, which seems stupid to me because there is room for another plate. I will modify a cover or make a GF one. even the racing boys use them…. Looks like you have to remove about 5 mm from the drum for it to miss the cover . 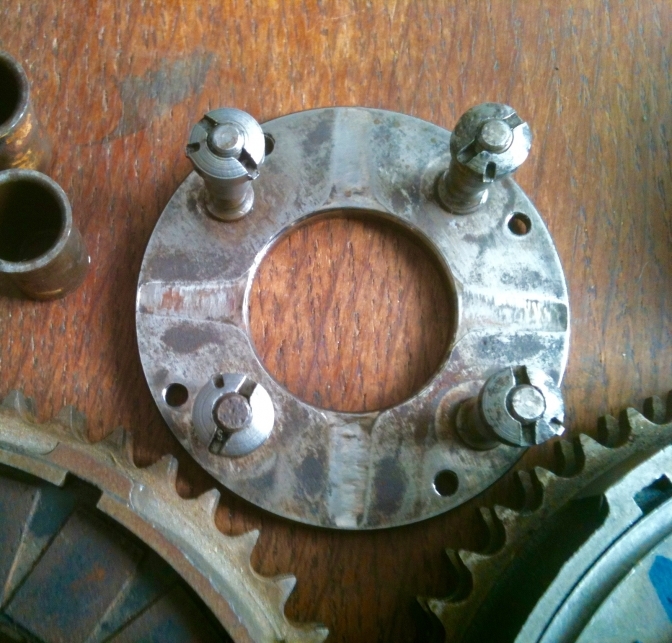 Got both clutches apart yesterday, not has easy as it looks, drilling out the rivets. 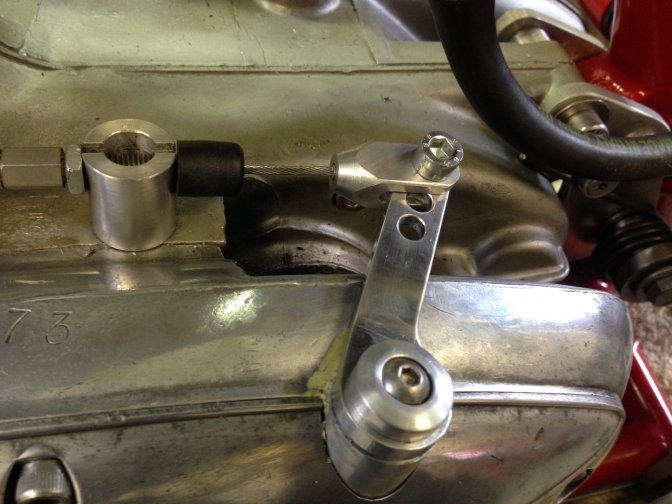 then had to remove the cush drive bosses from the Yamaha Basket…. The centre hole in the Yam clutch needs enlarging to fit the Bantam sprocket carrier.. and yes you do have to remove material from the basket fingers. I would use copper rivets if it was not for the fact that the kickstart ratchet is also a part that is riveted. And not a six month wait for one. The problem is clearance for the kick start mech there is not room for nuts, It is OK on a racing Bantam a they don't have the kickstart. is a spigot on the sprocket that could be turned down slightly, to help this situation. but removing most of this will nearly do away with the positive location of the basket. I may take some of of both, that seems like the most sensible thing to do.? 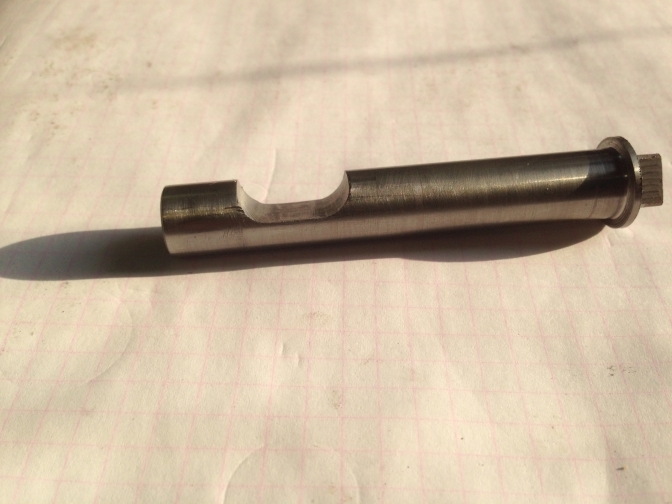 I think fitting flat head would be far better than countersinking the alloy even if you had to use a small spacer on the shaft and there is still enough thread for the nut by the look of things. Was it me that started this Bantam stuff… should have stuck to the pit bikes…. I have Paul down the road from the workshop who has a mini cnc mill and I know if he had time he would set it up to run some through.. It is now time to decide whether to bolt or rivet the two together... 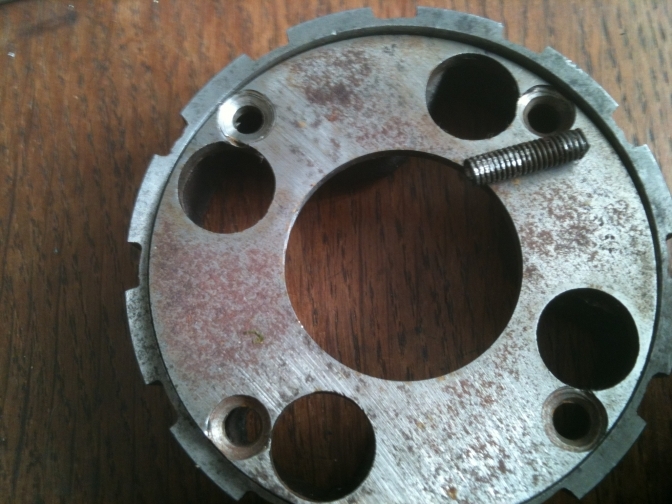 The kickstart flange is the problem has this needs to be fixed securely with steel bolts or rivets to take the strain. Unless I bronze weld it to the sprocket carrier? You saying I am bodging a clutch then? I have just spent from 3pm until now 6.30,hand filing the splines so that they are how I want them, even Blue printed them to get it right.And I have the blister on my thumb to prove it. I must say it is a lot of trouble, but I have started so I will finish, and it may just show that you can spend a lot more time than money to get something that works. I hope it does after the effort. 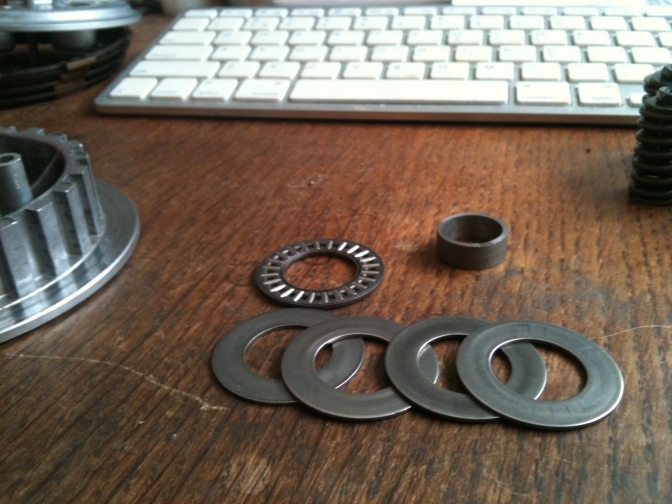 The spacer washer splines are much too hard I will have to grind them with a Dremell. Paul is going to get back to me if he thinks he has time to program his mini CNC to make a basket it has a funny program so he is the only one that knows the system to write it up. 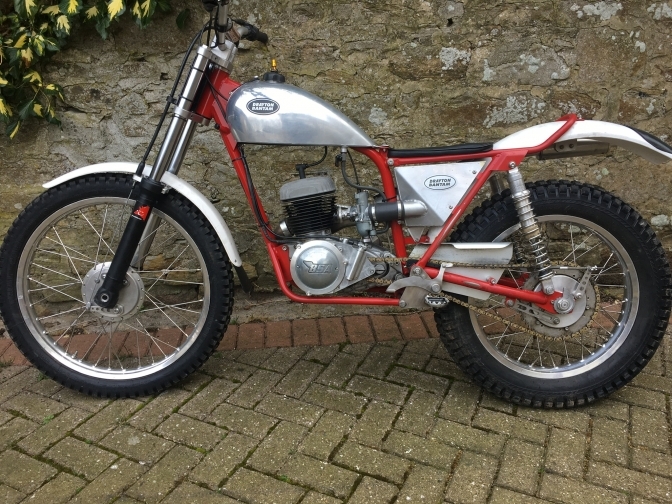 Yes it does seem stupid that you would pay up too £8K for a Bantam trials bike that has not got a tuned exhaust or like you say an airbox . Just spending the time doing this clutch,you think there is so much more you could do to get a Bantam run a far bit better, and buying bling bits and throwing at the bike, when you could like you say spend that money on parts that makes the bike run with more power and torque, and make a much more competitive machine. 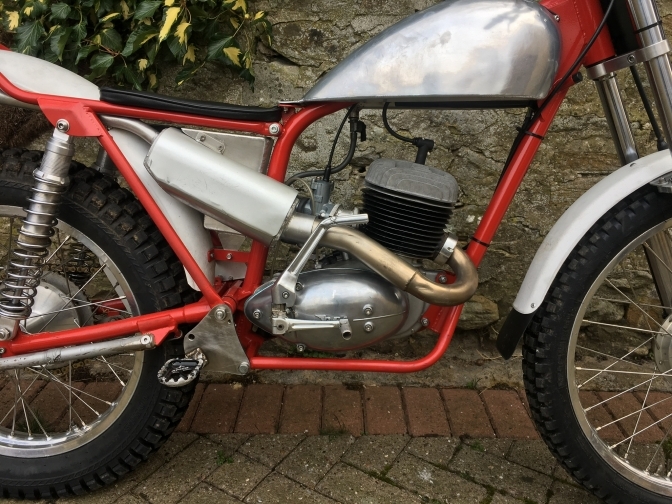 But most owners of Bantams only are out for the ride, so why spend £8K on something that does not work any better than ,My Old three speed model that was bought out of the local paper a few years back, built by a tester for BSA and up to a days fun riding all for £500….. Yes there must be something that fits the bill just as well as the Yamaha clutch, the Fantic alloy basket looks promising. are they still available? 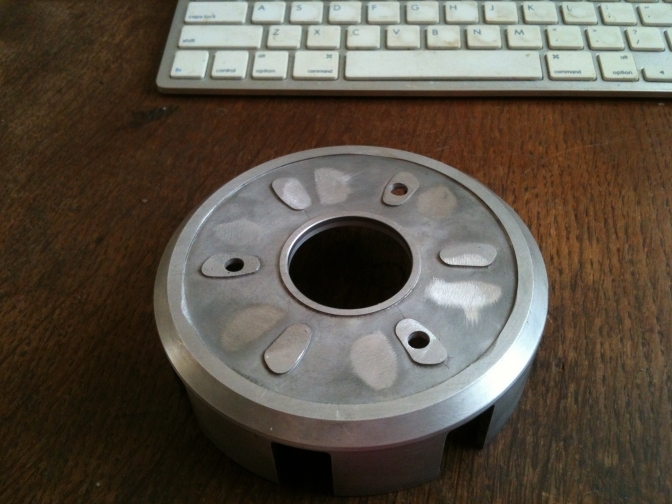 I have made the spacer needed for the splines and to locate the thrust washer. but clearance is very tight, and I can see why countersink rivets are used… Maybe i will have to go that way, but I don't like using steel rivets on die cast aluminium…. 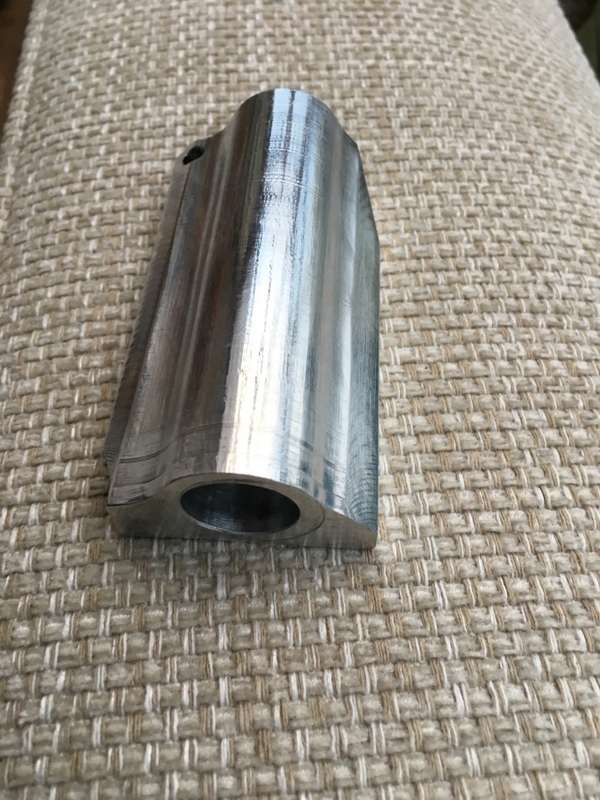 We again this afternoon think the best way would be to get the basket billet machined, you could do most on a lathe and, then just use an end mill to cut the fingers…. 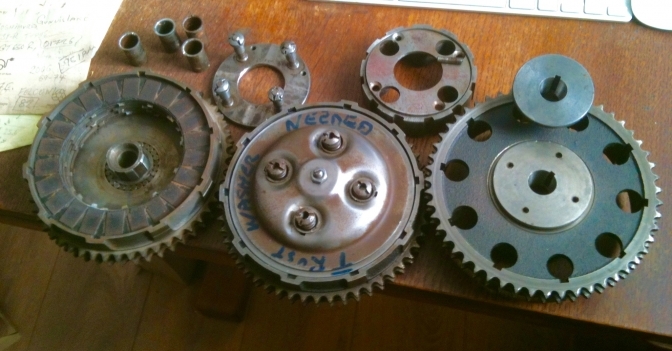 In a later email it was suggested , why did I not try a clutch from a pit bike as I know these. 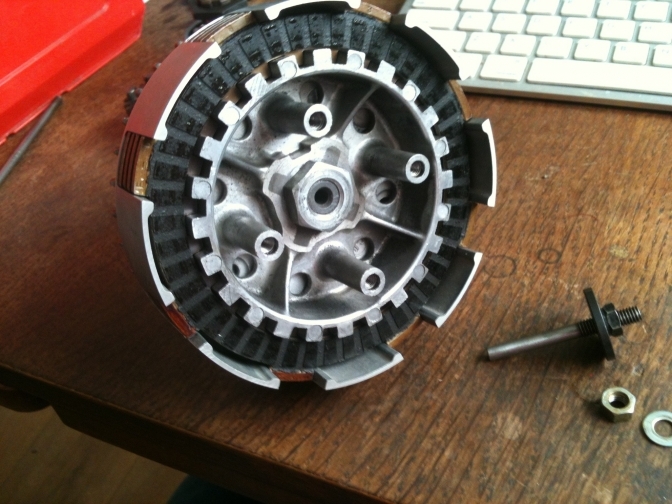 But at under £30 for a complete clutch unit it may be worth taking a look later. when I have got this Yamaha unit up and running. So yesterday afternoon was spent machining up the spacer to go over the Bantam splines and to allow clearance for the clutch centre from the basket. I copied the profile and depth of the Bantam centre which was a mistake? Well the spacer needed to be 2mm deeper and slightly wider ,to do the job. so two hours wasted but this is the learning curve. So I will have to make another tomorrow. 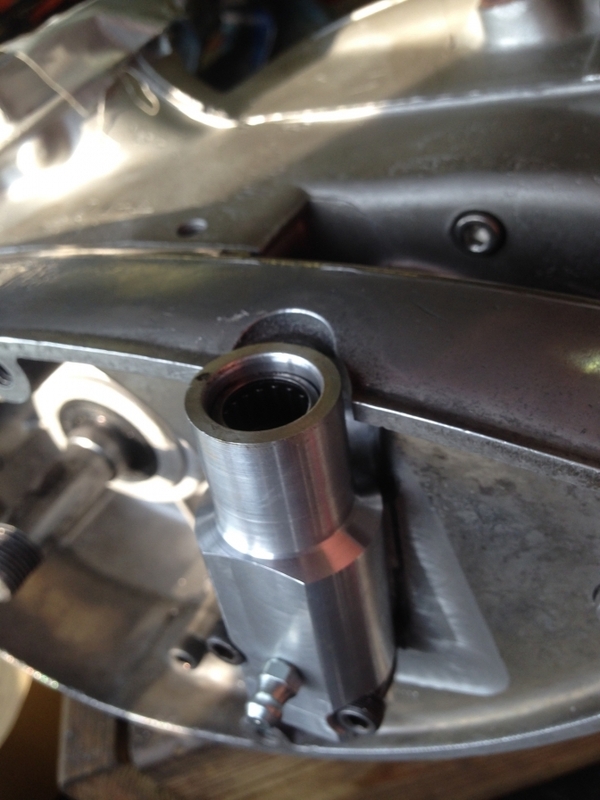 but we are getting there and even the centre nut lock-tab from the Yamaha will fit if filed out slightly. The spacer that needs to be 2mm deeper.the depth of the second one on the right. you can see that I have faced off the clutch basket, and filed out the splines to fit the Bantam gearshaft. So yesterday I made the other spacer up and this has given the clearance necessary. in fact when every thing is riveted and bolted, I may be able to take another Millimetre off of the spacer the more of the splines used the better. So I will not give you the final dimensions of the spacer yet. I also ground the actuating push-rod (Yamaha) down to fit the Bantam gear shaft ,and finished it on the lathe. The clearance behind the centre hub may just give enough room to be able to use button head bolts instead of rivets, but we will see. I have tried the chain onto the sprocket , and there is bearly enough clearance so when the hub is bolted, or riveted up, I will take a small amount off to get the clearance. But I don't want to take a lot off as it will weaken the basket. Ian Bowers, The Clutch Guru. So Ping went the in-box, and I had this from Ian, and the accompanying photos of his conversion, now we know we are on the right tracks now. Ian Thank you so much. And keep us in line by updating if you can. And yes we will have a go at the actuator. I did my own Yam clutch conversion a couple of years ago using a second hand clutch for £25! In case I’d didn’t work. I made some steel rivets with countersunk heads which worked fine. I also turned bits off the basket left right and centre. I got the splines to fit quite quickly, but think I bored out the centre slightly, I also made a stepped nut and counter bored the clutch centre so I had a full nut width of threads. I made a new push rod from silver steel and a custom cam type actuator that works really well. It’s been in over 2 years now and has done over 50 events without any issues. And the Basket side...Riveted by Ian..
Ian's Fitted clutch and basket. I also fitted a bearing in the outer casing and this holds a nylon shaft that pushes into the gearbox output shaft, there is an o ring on the bearing end to keep the water out. There is a hole in the middle to steady the clutch push rod with an o ring in, to keep the oil in! I was waiting for the wheels at the time so a had a bit of spare time! Ian has now uprated (or Down) the covers on his bike to make it more retro looking. I thought it was time to give the Bantam a “face drop”.....by fitting some bits that were made before 1965! I’ve replaced the clutch cover and fly wheel cover with D7 versions, this meant making another actuator housing and machining many bits of the cover, making a mount for the stator, a new outer cover! It’s about an inch slimmer and looks a bit different. And the timing side cover. More Photos and updates Later..